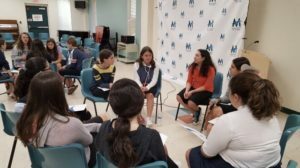 At Ma’ayanot, everyone has the opportunity to not only step up and lead but to learn practical skills through which they can succeed as leaders. Through leadership training programs during orientation and midterms, G.O. and Committee heads have the opportunity to set personal leadership goals as well as come up with a vision for what they want their committees to accomplish over the course of the year. The Leadership Training Program is carefully crafted in a way in which students can choose the best possible sessions that will be the most practical for them. These sessions include learning helpful websites to use when making a program flyer, hearing from social media experts about how to successfully publicize events and raise attendance levels at programs, and learning about group dynamics and teamwork skills from Experiential Education experts. 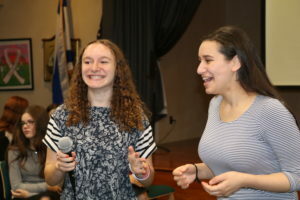 Students leave Leadership Training Seminars with a toolbox of practical skills that empower them to step up as successful leaders of Ma’ayanot.